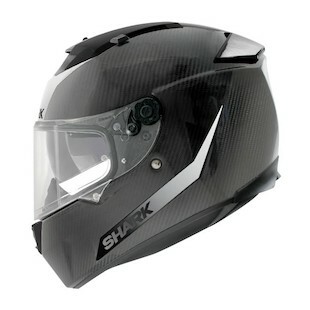 Shark Speed-R Carbon Helmet: Skinned for Speed! Is there anything on Earth that screams “SPEED” more so than carbon fiber? Auto parts stores around the globe have shelves stocked full of carbon fiber accouchements to make even the slowest of Honda Civics look like they were bred for the track. It looks like Shark has finally caught on to this trend by releasing the new Speed-R Carbon Skin. Just like adding carbon fiber trim to the door panels of your Hyundai Tiburon, Shark has skinned their popular Speed-R helmet in the classiest carbon to give it that go-fast aesthetic the modern speed freak craves. So, if you have just added a Two Brothers Carbon Black Series exhaust to your new Busa or ZX14 and are looking for helmet to match, look no further. The Shark Speed-R Carbon Skin will be right at home hooked to the back of your bike as you scream down I-95 wearing nothing but a leather vest and goggles (but seriously, wear a helmet). So if you’re all form and no function and have an extra $500 to spend on the Carbon Skinned version of the Speed-R, get after it son! If you’re not first you’re last.